She hurried to the porthole and looked out. The sky was filmed with cloud through which the sun glowed sullenly, casting an eerie yellow light. The sea was dull and oily-looking. At first she could see nothing unusual. And then she began to pick out dark shapes beneath the surface of the water, many, many dark shapes, and as she realised what they were, the hair on the back of her neck began to prickle. Although the Star of Deltorahas managed to escape Illica, Britta is still in danger. She must stay in her cabin, safe from the moody distrust coming her way from the ship’s crew, who think she is a witch and the reason the voyage has been beset with problems. In spite of Britta’s protestations, the ship is being surrounded by turtles, seeming to want to steer the ship. Britta soon realises that the Staff of Tier has sensed her, and wants her to come to the Hungry Isle. Could it be that her secrecy has lead her and her friends, including Trader Mab, into terrible danger? 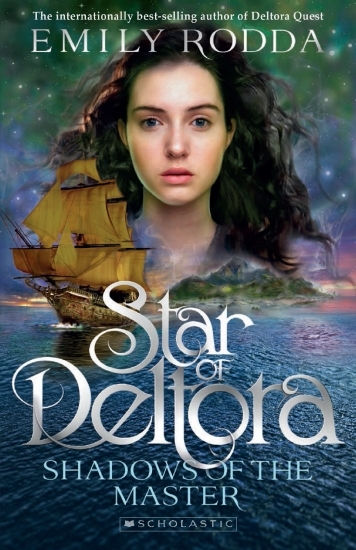 The fourth title in the Star of Deltora series, The Hungry Isle provides a gripping climax to the journey that Britta and her fellow would-be Trader’s apprentices have been on. Britta has managed to keep her true identity – as the daughter of the hated Dare Larsett – a secret, but when everything hangs in the balance, the secret is no longer hers to keep. Best read after the first three titles, The Hungry Isle is a satisfying conlusion to the series. And at that moment, Britta threw caution to the winds. She tore her eyes from the model ship and looked up at the old man staring at her so anxiously. For as long as she can remember, Britta has wanted to be a trader like her father. But since his quest to find the Staff of Tier brought disgrace to his name and to his family left behind, that dream has seemed unreachable. Now, though, she has a chance. There is a challenge to select the apprentice to the Trader Rosalyn. and Britta is eligible – as long as the townspeople don’t realise who she is. Determined to be selected, Britta risks everything for the opportunity of a lifetime. Shadows of the Master is the first in the new Star of Deltora series. Set in the same reality as the Rowan of Rinn and The Three Doors series, this new series promises to be as much loved as its predecessors. Readers will bond with the resourceful Britta and her efforts to follow her dreams in spite of her insecurities. Other characters are also intriguing, and it will be interesting to see how her fellow apprentices – three every different characters – develop across the series. While young fantasy fans are likely to appreciate the book, it also likely to appeal to those who are perhaps less familiar with the genre, because it is both accessible and well-paced, at a length that is not too daunting. A gripping introduction to what promises to be an excellent series. The Doors are magic, Faene,’ Rye broke in, as the young woman turned her repraochful gaze on him. ‘They could lead … anywhere. The Golden Door led Dirk here. But I am certain that Sholto would have chosen the Silver Door. So to be sure of picking up his trail, we must go through the Silver Door ourselves. Do you see? Now that one brother is safely back from beyond the Golden Door, Rye is determined to do anything he can to rescue his other brother, Sholto who, he is sure, will be beyond the Silver Door. Only then will he be ready to venture beyond the third door, the wooden door, in a quest to rid Weld of the menace of Skimmers, creatures who come in the night to eat anything that moves. The Silver Door continues the adventures of Rye and his new friend Sonia as they work through their dangerous quest. Weld has been under seige for too long and, for too long, the young men of Weld have ventured through one of three magical doors in an effort to discover the source of the Skimmers and thus destroy them. With both of his brothers gone through the doors, and his mother now forced into a pauper’s life of service, Rye is determined to reunite his family and find a way to free Weld. In The Third Door the adventurers venture through the third and final door in their attempt to end the quest they began when they entered the first door. Young fantasy lovers will delight in the adventures of Rye and his friends, with intriguing characters, twists and turns, magic and satisfying resolutions. Whilst each book is fairly self contained, they are best read as a trilogy. Every night vicious flying creatures – Skimmers – attack the city of Weld, flying over its towering walls and eating anything alive they can get to. The people cower in shuttered, darkened houses, listening to the terrifying attacks, powerless to stop them. Then the Warden calls for volunteers to leave the walled city and find out who is sending the skimmers, and how they can be stopped. Like all the other citizens of Weld in skimmer season, Lisbeth and her sons went to bed early. What else was there to do, when sound was dangerous, and the smallest chink of light might lead to a skimmer attack? Rye lay in the room he shared with his brothers, listening to the rush of wings outside the shutters, the occasional scrabbling of claws on the roof. He prayed that the wings would pass the house by. He prayed that he, his mother and his brothers would not wake, like those ill-fated families in Northwall, to find skimmers filling the house, and death only moments away. The Golden Door is gripping fantasy by one of the finest creators for this age group, Emily Rodda. Rye is an unlikely hero – not strong, not smart, the youngest son – with the courage to try for the sake of his brothers, his mother and his city. He is accompanied on his journey by a girl who claims to be a resident of the Warden’s keep, but who readers will suspect is perhaps the Warden’s daughter. The tale is full of the things which Rodda fans have come to expect – weird and wonderful creatures, seemingly insurmountable obstacles, and lots of action. The Golden Dooris the first in a trilogy. Readers will look forward to the next. This book is available in good bookstores, or online from Fishpond. Buying through this link supports Aussiereviews. It was very dry in Bungawitta. It had been dry so long that Glory-Alice, the youngest person in town, had only seen rain on TV. It had been dry so long that old Maisie Macduff, nodding and dreaming on her front verandah, sometimes thought she had made rain up. Bungawitta is shrinking. As the land dries up, so does the town. Nearly all of the animals are gone. The paddocks are dry. The plants are dying. And most of the people are gone, too. Now there are only twelve people left. If they don’t do something the town will die. Jay might be young but he has a big idea. Bungawtta needs to hold a festival. People will come and see how good the town is – and they’ll spend money, too, which will keep the town going. But the day of the Earth Sculpture Festival is full of surprises. Bungawitta is a heart-filled humorous tale of community and friendship, as the twelve different residents of Bungawitta each do their bit to ensure Bungawitta’s survival. From one of Australia’s best-loved children’s authors, and illustrated by equally well loved illustrator Craig Smith, this is an outstanding offering for primary aged readers. Determined to take control of Rondo, the power-hungry Blue Queen has a new, secret plan, and an enchanted dragon to help her carry it out. Leo and Mimi Langlander return to Rondo once more for what could be their final visit. With an enchanted dragon and a mesmerised princess on their tail, they’ll have to fight ogres, witches, and much more. They’ll make surprising allies, and even more surprising enemies. Along with a band of misfit heroes, they’ll unite Rondo in one final battle. A great read for children 10 to 14 years old. Lots of excitement and fantastic tales await the reader of this fantastic book. Battle for Rondo is an exciting mythological adventure written by the internationally best-selling author, Emily Rodda. If you owned a magical music box that could transport you to another world, wouldn’t you use it? This book picks up where The Key to Rondo left off. Mimi Langlander has gone to a violin camp for a week, and Leo has been left alone with the magic music box. His curiosity gets the better of him and he watches time passing in Rondo. When Mimi returns she notices at once that he has been watching Rondo and demands they return to Rondo at once. Once inside Rondo they meet with their friends and set off on an exciting adventure which takes them far and wide. Along the way they encounter a boy who is a mushroom, a flying carpet, and a tree that acts as a campsite for adventurers. The Wizard of Rondo is an exciting mythological adventure, the second in this series. A great read for readers of the first book. Lots of excitement and fantastic tales await the reader of this book. A great sequel to The Key to Rondo. Important! Turn the key three times only. Never turn the key while the music is playing. Never pick up the box while the music is playing. Never close the lid until the music has stopped. Leo Langlander inherits the music box that has been passed down his family for generations. He knows to follow the rules but when his cousin Mimi comes to stay, havoc is released upon the land within the music box and Leo and Mimi are stranded there. Now they are on a quest to find and defeat the sinister Blue Queen. Not knowing who to trust they set off on an exciting quest from which they may not return. The Key to Rondo is an exciting mythological adventure written by the internationally best-selling author, Emily Rodda. A great read for children 10 to 15 years old. Lots of excitement and fantastic tales await the reader of this fantastic book. Jessie’s heart lurched. She remembered Tasha’s silver fairy wings. Her grandmother’s voice echoed in her mind. Jessie has always enjoyed her adventures in the Fairy Realm, travelling through the door at the bottom of her grandmother’s garden, but when another human child, four year old Tasha, accidentally enters the Realm, Jessie knows she could be in trouble. She must find Tasha and return her home before anything goes wrong. Meanwhile, she must also stop her sticky beak next door neighbour, Mrs Tweedie, from finding out too much about the Realm. Has Mrs Tweedie sent Tasha in deliberately and what can Jessie do about it? The Rainbow Wand is the fourth and final title in the second series of the Fairy Realm series. There are plenty of fairies and other magical creatures, as well as adventure and mystery. This audio book version is beautifully read by Lucy Bell. This is a story well suited to reading aloud and with a running time of just under two hours would suit a car trip or plane journey. One Thursday morning, Bob woke up and went downstairs as usual. He knew at once that something was wrong. Someone had cleaned his kitchen. Nothing looked the same. Even the kettle. Someone had washed the windows…And on the table, instead of the Cornflakes pack, was a dainty plate of fairy bread and a flower in a vase. Bob the builder is a very happy man who lives alone and is happy that way. But one morning he wakes up to find that his house has been infested with elves. Now everything is clean and shiny and Bob has to go to work with his boots and hard hat polished and fairy bread in his lunch box. Bob needs to get rid of the elves before his mates come around to play cards in Saturday night. But how? This is a humorous offering for younger readers, with delightfully funny illustrations by the talented Craig Smith. Since its was first published in 1998 it has been reprinted 6 times (this latest edition with anew cover) and has won a swag of awards, including being named a Children’s Book Council Honour Book.